Gilbert is a non-player character in Bloodborne. You first meet him in Central Yharnam after ascending the ladder that lowers after pulling the lever. He is located just behind the first Lamp you will find. To speak with him you must approach the window there and press "X". Gives Flamesprayer as a gift after killing Father Gascoigne. You have to talk to him before beating Amelia and starting night, as well as after visiting Cathedral Ward at least once. If you don´t obtain it from Gilbert, you can buy it from the Shop after obtaining the Radiant Sword Hunter Badge. After the moon turns red (upon killing Rom, the Vacuous Spider), you will find him as a hostile Old Yharnam Beast near his window, drops Clawmark Rune if killed. 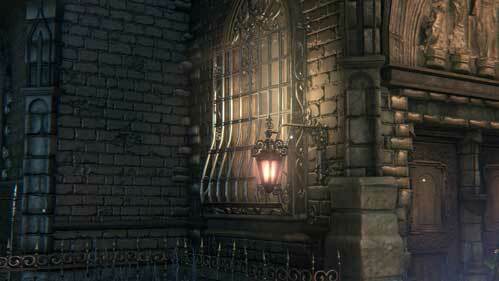 Gilbert is found in Central Yharnam, right in front of the Lamp. "Oh you must be a Hunter, and not one from around here either. I'm Gilbert, a fellow outsider. You must have had a fine time of it. Yarnham has a special way of treating guests. I don't think I can stand if I wanted to, but I'm willing to help, if there's anything that can be done (coughs). This town is cursed. Whatever your reasons might be you should plan a swift exit. Whatever can be gained from this place, it will do more harm than good." "Paleblood, you say? Hmm... Never heard of it. But if it's blood you're interested in, you should try the Healing Church. The church controls all knowledge on blood ministration, and all varieties of blood. Across the valley to the East of Yharnam lies the town of the Healing Church, known as the Cathedral Ward. And deep within the Cathedral Ward is the old grand cathedral. ...the birthplace of the Healing Church's special blood, or so they say. *coughs* Yharnamites don't share much with outsiders. Normally, they wouldn't let you near this place, but... The hunt is on tonight. This might be your chance..."
"Yes, I see... But the great bridge is the only way to the Cathedral Ward. And during the hunt, the bridge is closed... Hmm... You could try the aqueduct? There's a rather, how shall I put it, colorful area south of the great bridge. From there, an aqueduct leads to the Cathedral Ward. *coughs* Not a place you'd normally want to visit, but... I don't imagine you have much of a choice. Do you?" " *coughing* An aqueduct leads from the town, south of the main bridge to the Cathedral Ward. Not a place you'd normally choose to visit, but... Not much of a choice, with the bridge closed. *heavy coughing*"
Ahh, you needn’t concern yourself with me. I’m afraid I’m of little help now. But before I… Take this…(he gives you the Flamesprayer) I made no use of it, but perhaps you… What inflicted me was incurable, but this town gave me hope… Their strange blood bought me time. I was most fortunate. Unharmed by the plague of beasts, I can even die human. *coughing* "
Dear gods, what have I done? Upon meeting Gilbert one will notice his odd cough. It is apparent he is sick. He will help the hunter with pieces of information and a weapon until he eventually turns into a beast and becomes hostile. Gilbert describes himself as a "fellow outsider" to the player hunter. This suggests that he traveled from another land to Yharnam, in hopes of finding a cure for his incurable ailment. According to him, the "strange blood" bought him time but his incurable disease is slowly taking its toll on him. Gilbert may have been one of the hunters that burned Old Yharnam to the ground since he gives the player hunter the Flame Sprayer. During the blood moon phase that occurs after killing Rom, Gilbert transforms into a beast similar to the beasts that plague Old Yharnam and the Loran Chalice dungeon. From the description of the Antidote found all over Old Yharnam, the antidote counteracts poison offering short-term relief from the Ashen Blood disease that ravaged Old Yharnam long ago. Ashen blood is similar to poison and the antidote is used by hunters in an attempt to combat the ailment; all beasts from Old Yharnam are capable of poisoning. It is speculated that Gilbert caught this incurable Ashen Blood ailment during the burning of Old Yharnam. This would explain why he transforms into a beast similar to the beasts located in Old Yharnam. His mention of even being able to die human is reminiscent of dialogue from Anastacia of Astora in Dark Souls, possibly a reference. If you fight (or just hit the wall) near his window, he will never speak to you. If you hit his window with a pebble, he will ask if everything is alright and tell you to stop. When the sick old man is a beast but not afraid of fire like others lol. But still in all honesty, Gilbert lives a sad tale. This page keeps suggesting he participated in the burning of old yharnam but the only things that link him is the flame sprayer, that he claims to never even had used, and his beastmodel being the same as the beast patients even though it doesn&apos;t share the same behavior as them. Since he says he got not use out of the flamesprayer, I figured he didnt actually participate in the burning of old yharnam. Maybe he still caught the sickness at that time, though, and couldnt participate because of it. Anybody know who the dead NPC is around the right corner of the Central Yharnam lamp? I can&apos;t remember if the corpse is there from the begining of the game or not. Maybe Gilbert was able to die human after all? I spoke to Gilbert while farming for bullets in Central Yharnam after killing the Vicar and entering the Forbidden Woods, and he has some more dialogue. It&apos;s also noteworthy that he, unlike the other Beast Patients, is not afraid of fire. He&apos;s still incredibly vulnerable to it, but he doesn&apos;t back away if you&apos;re holding a torch, perhaps countering the theory that he was involved with the burning of Old Yharnam. He said:"Unharmed by the plague of beasts, I can even die human." Finally, he become a beast and attack me! So if you kill Rom but don&apos;t trigger the Blood Moon (i.e. by using the Hunter&apos;s Mask or the lamp) and go back to talk to Gilbert, he just coughs a lot. Not going to lie, I was hoping there would be some dialogue. The Hunter NPC with the Beast Claw you fight in the Hunters&apos; Nightmare version of his place, must be his nightmare counterpart, or some reflection of him. Turns out while screwing around with the beast claws while waiting for a friend, I attacked the window (I have finished the game so he had been dead for some time) and it started building my beast meter. This may be a scary coincidence or a nice little easter egg but either way, its weird. So I talked to him a few times on my NG+, but now I&apos;ve killed Gascoigne and all I get is "No Response". I&apos;m not particularly concerned with getting second flamesprayer, I want to make sure he&apos;s still there for when he turns violent. I want that Rune I missed the first time. Is it normal to be getting no response from him? Gilbert gave me a Tonsil stone and said to seek the godhead. What I did this run (Beat cleric beast first, Gascoigne second, initiated dialogue with Eileen twice (for the Ssh! gesture), killed Henrick with her, then defeated Amelia. Remembering I wanted a Flame-Spitter, I returned... only to have him give me a Tonsil and repeat that dialogue. If You look into his room via window You&apos;ll see that where doors should be there is a brick wall. They forgot to give him doors thus he escaped with window. He gave me the flamesprayer after I killed gasciogne, unfortunately I had just bought one right before that lol. I only found out about the tongue stone after killing Rom and going to Unseen Village. I checked on Gilbert and he was a beast that broke through the window. I went to every house with a light in the game and got no response, until I went to the house in the Woods next to the dog cages. The guy sitting in the house gave me the stone after talking, he looks like a regular enemy and you can see him breathing through the boards. I guess Patches possessed this guy or something? theres two extra lines he says once you lure an enemy next to him (and kill it? ), if someone wants to look into that. I have a theory that Gilbert is actually the Young Yharnam Girl&apos;s "Granddad" (and Gascoigne&apos;s father). The trigger for getting the gift from Gilbert (the flamethrower) is killing Gascoigne, indicating at least some kind of connection. He and Gascoigne both come from a foreign land, and both have the same accent, as I hear it. They both suffer from the Plague, and they seem to be at a similar stage in the Plague&apos;s evolution, indicating they "caught" it at roughly the same time--when they came to Yharnam together. Gascoigne&apos;s daughter has the standard Yharnam accent, but she is young enough that she could have been born in the city after Gascoigne already arrived. Perhaps Gascoigne married a Yharnam woman, Viola, after he and Gilbert travelled to the city. That&apos;s not a whole heap of evidence, but there&apos;s currently none to the contrary that I&apos;m aware of. What do you all think? Is it possible? I feel it&apos;s a but too much speculation to say Gilbert was one of the hunters that burned down Old Yharnam, or even a hunter at all, especially since when he gives you the Flamesprayer he specifically says he never made use of it. Hey, I don&apos;t know if it&apos;s due to last updates, but I talked to him once the first time you encounter him, then I forgot about him and came back later after defeating Vicar Amelia and he gave me the Tonsil Stone to acces the Nightmare Frontier instead of the Flamesprayer, and his dialogue changed too.